It’s 2012 and slavery still exist smh. This time it is in the form of a shoe! Lol. I’m not going to lie the shoe is actually clean until it reaches the point of the ankle where you have these golden slave shackles attached to the shoe. I love shoes, but this is something different but offensive at the same time. I mean we are already slaves to society, so now we bring out a shoe to remind us of that lol. Adidas and eccentric Beverly Hills designer Jeremy Scott are under fire for a new shoe design that critics say calls up painful images of slavery. The shoes come with a set of plastic shackles, and a tag line on Adidas’ Facebook page strikes a playful tone: “Got a sneaker game so hot you lock your kicks to your ankles?” Are you serious? 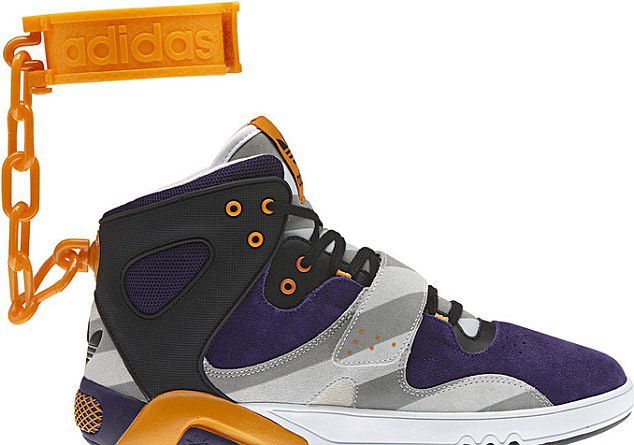 The shoe was due to drop in August but Adidas withdrawn the shoe from releasing. Jeremy Scott wasn’t able to be reached a representative of Scott said, ”The design … is nothing more than the designer Jeremy Scott’s outrageous and unique take on fashion and has nothing to do with slavery.” Well if that’s the case how about Adidas make a pair of matching “Kunta Kinte” socks! Lol. But hey, it won’t matter if they are released people will still buy them anyway (slaves). So who cares?! 2 Responses to ADIDAS SHACKLE SHOES?! Oh just like how hand cuffs can’t be used anymore because it reminds people of slavery? oh , wait we still use hand cuffs.